(Phys.org)—A team of researchers from Germany and the U.S. has found that a non-avian dinosaur living in what is now China laid colored eggs. In their paper published on the peer-reviewed site PeerJ, the team describes their study of the egg fossils and what their findings suggest about the evolution of colored eggs in modern birds. Many modern birds lay colored eggs—some are monochrome, like blue robin's eggs; others are multi-colored like those of the dove. But until now, it was believed that all dinosaur eggs were white because dinosaurs laid their eggs in protected nests. In this new effort, the researchers have found an example of a dinosaur that laid blue or green eggs. 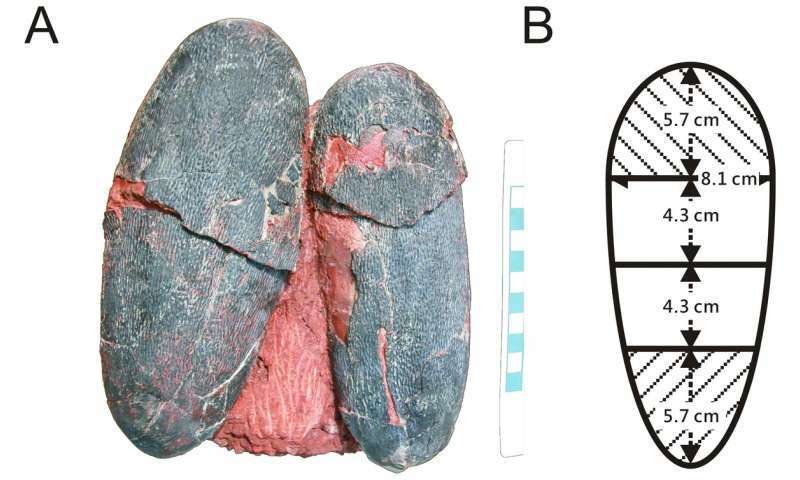 The team reports that theirs was the first effort to seriously study color in dinosaur eggs. It came about after the team noted some Heyuannia huangi fossilized eggs that had a bluish tint—researchers had previously assumed the tint was due to mineralization, but the new team thought maybe there was more to it. Prior research had shown that Heyuannia huangi were dinosaurs with parrot-like beaks that walked on hind legs. The team used mass spectrometry and chromatographic separation to take a closer look at the eggs and detected traces of biliverdin and protoporphyrin, pigments commonly found in modern colored bird eggs. The eggs were also dated back to the Late Cretaceous period, which ran from 100 to 66 million years ago. The oviraptor Heyuannia huangi were also feathered dinosaurs—many of their fossils have been found over the years, but until now, no one suspected that they laid colored eggs. The coloring, the team suggests, is a strong indication that the eggs were laid in open nests—the coloring would have served as camouflage. In modern birds, only those that lay them in open nests are colored. Their finding also shows that egg coloring began before the evolution of modern birds—it started with non-avian dinosaurs and was passed down to modern ancestors. The researchers report that as a result of their find, they are taking a look at other fossilized dinosaur eggs to see if perhaps some of those also were colored.